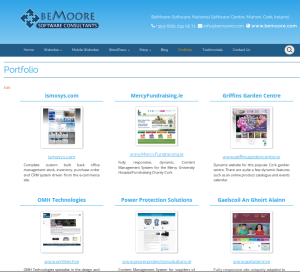 BEMO A-Z Index - BeMoore Web Solutions Ltd.
Want to remove the annoying advertising that led you to this page? Buy the plugin! Click “Add to Cart” below. This is a plugin that provides a customizable A-Z index of the posts displayed on a particular page, category or product listing. I have added a new interface to make it easier to use this plugin. All you have to do is open up your page editor and you will see an A-Z index icon. Below are a list of topics on various ways to use this plugin. 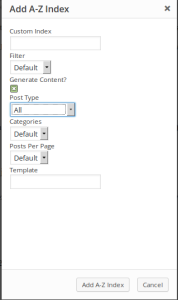 A blank page that you want to list something like Posts or Products in WordPress on. A completely new Index you want to build from scratch. Let’s have a look now at the various scenarios. 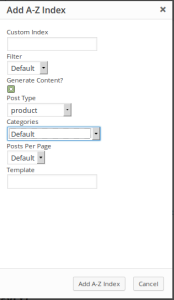 A blank page that you want to list something like Posts or Products from WordPress on. Let’s say you have a blog page and you want to create an A-Z Index of your WooCommerce products in a certain category on a blank page. First, create a page. Then, click the icon in the screenshot below. Click image to enlarge. Select the Post Type dropdown. If you have WooCommerce installed, there should be a “Post Type” called product. Select this. You will now see that the categories box will change. This allows you to specify a product category too if you wish. Default is to show all. Now click “Add A-Z Index”. This will add a shortcode like the one below, and should generate the required content. 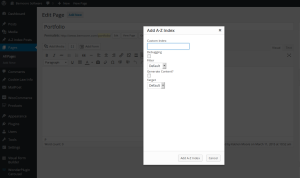 Use the A-Z Index Posts Menu in the WordPress Admin to add all your posts and post categories. Then just follow the same procedure as above, EXCEPT set the Post Type to “azindexcustom”. 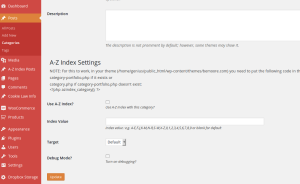 This is a bit more tricky and requires you to be comfortable with editing WordPress template files. Let’s assume your category is called blog …. Please note that this may or may not work, it depends on how the page template is set up, in more technical terms if it uses the WP loop or not. The only way to find out is to try. This gives us the dialog box below. You can add your own custom index here. BEMO A-Z Index has a built in debugger to see what is actually being filtered.WordPress runs several queries and depending on what plugins you are using, what themes etc you may be filtering the wrong query. The debugger lets you see what the right Target query is. Indexes should be uppercase, and contain commas between each index. They can be single characters or a range. Z,Y,X,W-A,0-9 Here we have a reverse index. You can also filter by Content, Excerpt or Slug.